Did you know? In 1975 a 17 year old boy was killed while riding his moped. He was killed exactly a year after his 17 year old brother was killed while riding the same moped, in the same intersection, by the same taxi, with the same driver, carrying the same passenger. Seems far fetched, so I Googled it. It's making its appearances on about.com, the Snopes message boards, and many other websites. The source cited in each case is a book called Phenomena. A Book of Wonders by John Michell & Robert J. M. Rickard. There's no preview on Amazon and I didn't get any Google image hits for various search strategies (I was hoping to see the actual page with the story). Is there evidence to suggest this was a real occurrence (aside from it being said to exist in a book)? 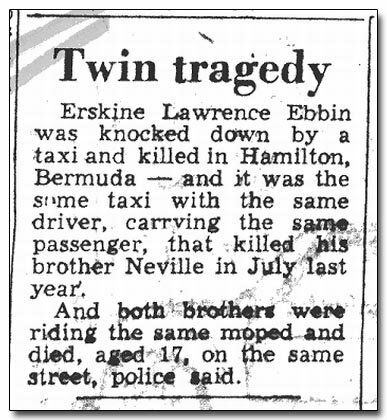 Erskine Lawrence Ebbin was knocked down by a taxi and killed in Hamilton, Bermuda — and it was the same taxi with the same driver, carrying the same passanger, that killed his brother Neville in July last year. And both brothers were riding the same moped and died, aged 17, on the same street, police said. It is remarkable in that it includes the full name of both brothers (Erskine Lawrence and Neville Ebbin) and the city in which it allegedly happened (Hamilton, Bermuda). This means it should be possible to verify the events by checking official records. Based on this, the accident might have happened — unlikely does not mean impossible — but there is no conclusive proof. Now that we have a source from Bermuda itself and a lot of verifiable data I tend to believe that it did indeed happen, though “at the same intersection” and “exactly a year apart” are exaggerations. Is adult life expectancy the same in hunter-gatherer tribes and in industrialized societies? Did people in ancient times, who survived childhood and were not killed in wars, have roughly the same chance to reach old age as contemporary people?